CFD (Computational Fluid Dynamics) simulations use numerical analysis and data structures to solve and study fluidic problems. 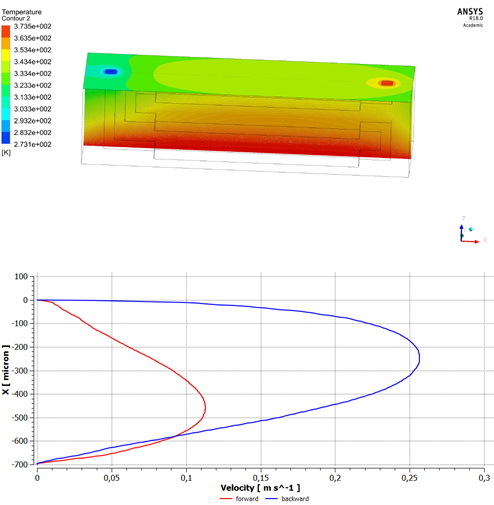 In our group, we use FVM (Finite Volume Methods) and FEM (Finite Element Methods) simulations with commercial codes (as ANSYS Fluent or COMSOL), to optimize customized microstructures, microsensors and microfluidic devices. One of the main problems of simulating these systems is the computational demand due to a very fine meshing. This is bypassed performing simulations supported by clusters of HPC@Polito. It is therefore possible to calculate and analyse physical quantities (e.g. pressure, temperature, velocity, mass flow etc.) using contour plot or data obtained directly from virtual modelling. These results are simply comparable with experimental data using common software such as Origin, Matlab or Excel. Figure 1. Panel (a) Temperature contour plots of a microfluidic 3D device. Panel (b) velocity axial profile of a microfluidic junction in direct/reverse flow.